101 Did You Know Facts About Jamaica! ..and not just facts, but INTRIGUING & ASTOUNDING facts about Jamaica! The truth is, there are some really AMAZING things about this our little country that admittedly, being a proud and patriotic Jamaican, I was a little embarrassed to have just found out. But as my loving grandma would say, Better late than never! And yes, I am ELATED to share them with you! that Port Royal in Jamaica was once labeled 'The wickedest city on Earth'? Better yet, that Jamaica was the first country in the Western world to construct a railway- even before the United States! that the Jamaican Flag is the ONLY flag in the world, that doesn't share any of the colors of the American flag? But there are many more facts about Jamaica that will marvel you!. 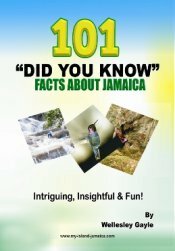 This 101 'did you know' facts about Jamaica book feature these and more of the most insightful and captivating information about the island. From Nature and Culture, to Politics, Sports & Society. This little resource is the only of its kind. "As a Jamaican I am almost ashamed to see how much of your information was new to me. I kept on reading straight through once I started. I wanted to find what else I didn't know about our fabulous little island. But why should YOU bother to get it? It makes a great Jamaican gift to your loved ones! If you are looking for a ideal, yet inexpensive, Jamaican gift, this is it! This 101 did you know' facts about Jamaica is highly informative, insightful and educational! Remember also that you will be given a meaningful, relevant and versatile Jamaican gift! It provides invaluable research information on Jamaica! Quite frankly, I doubt you will find another single resource that provides so much direct, noteworthy and intriguing information about our country-all in one place! Moreover, there is something from every aspect of Jamaica and Jamaican life included; and these include some of the rarest, weirdest, and most impressive pieces of information about this little rock! Whether you are a student, a teacher or a Jamaican enthusiast, it will serve you well. Not from Jamaica and planning to come here? This little book becomes your guide! The facts contained in it will help to reinforce your background knowledge of the country, and could very well help you to determine what to do, and where to go when you ultimately get here! I brought it to my sports club meeting and the interest it generated was awesome! It injected loads of trivia and thrill to what would otherwise be just 'another' meeting. Everyone was intrigued! And of course, you now have a nice opportunity to impress your boastful friends and family members who 'think' they know Jamaica! "...I had so much fun reading it. The book is such a good idea!" or Click Here to order right now. "...Very uplifting and informative, it makes me verrrrry proud to be a Jamaican! One Love"
I worked painstakingly over the last few months on this exciting project; reading, researching and networking to present you with a final product that will have you either exclaiming Wow! I would never guess that! or admitting that there are lots more to Jamaica than you thought you knew. You May Have Thought Jamaica Was Interesting, But Definitely Not This Interesting! Feel free to Contact me here if you need any help.